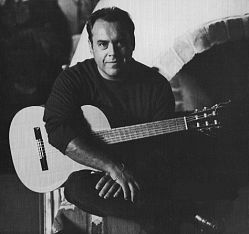 Born in Chile, South America, Claudio studied classical guitar for eight years at the Conservatorium of Music. Since then his musical style has changed to incorporate an extensive repertoire of contemporary music to which he has added his own Latin flavour. Songs include the romantics of The Beatles and Elton John, the Bossa Nova classics of Carlos Jobim, through to the dance sounds of Gloria Estefan and Santana. Claudio performed throughout Chile before leaving to work on the cruise ships around the Greek Islands. Since arriving in Australia 22 years ago, he has been a regular performer in restaurants throughout Sydney. He also performs at weddings, birthdays and New Year functions, etc. Although known as a solo entertainer, he also performs as a duo or with a Latin band. Visit Claudio's website and listen to his highly popular CD Tallawanta and other audiovisual samples. An accomplished guitarist of immense talent. Latin guitar at its best!